Barreto, P., Pereira, R., Brandão, A., Baima, S. 2017. Will meat-packing plants help halt deforestation in the Amazon? (p. 158). Belém: Imazon. The meat-packing plants that purchase cattle in the Amazon have been pressured by environmental campaigns and lawsuits to fight the deforestation practiced by ranchers. The pressure to eliminate deforestation, legal or illegal, is growing, since this is the most polluting activity in the country if we consider gases emitted by burning forests that contribute to global warming. Some meat-packing companies have committed to buying only from ranches without deforestation occurring after 2009. Seven years after the first agreement, we went to the field to see if the meat-packing plants can in fact contribute towards eliminating deforestation in the region. Based on new data and revised studies, we demonstrate that the agreements have advanced, but many still need to be done in order for the sector to effectively contribute towards eliminating deforestation in the Amazon. In 2009, the Federal Public Prosecution Service (MPF) and the Brazilian Institute for the Environment and Renewable Natural Resources (Ibama) sued meat-packing plants in the state of Pará that were buying from embargoed ranches due to illegal deforestation and the MPF also threatened to sue companies such as supermarkets and tanning factories that continued to buy from those meat-packing plants. In the same period, Greenpeace carried out a global campaign that alerted buyers of products from meat-packing plants that were associated with illegal deforestation. In order to free themselves from criminal charges and boycotts from part of the market, several meat-packing plants, including the four largest at the time, signed settlement agreements (Conduct Adjustment Terms – TAC) with the MPF and a public commitment with Greenpeace. The TAC is a legal commitment that, if not followed, authorizes the MPF to carry out sanctions without the need for court intervention. The meat-packing plants that signed the TAC committed themselves to buying only from ranches free of deforestation after 2009, off the list for work analogous to slavery of the Ministry of Labor, registered with the Rural Environmental Registry (CAR provides a map of the ranch and information on the holder of the property and serves as an identification card for the ranch) and that are not in Protected Areas. Later on, other meat-packing plants signed TAC in other Amazon states, creating the expectation that this type of agreement may be a promising instrument against deforestation. Below, we summarize the situation with the agreements, their advances and their challenges. 110 companies are responsible for 93% of slaughters in the Brazilian Amazon. We began with mapping to discover where the meat-packing plants that signed or did not sign the TAC in the Brazilian Amazon are located and what their characteristics are. Using government data and satellite images, we found 157 meat-packing plants registered with the SIE and SIF, which were responsible for 93% of slaughters in 2016 in the Brazilian Amazon according to the IBGE – The meat-packing plants registered in the State Inspection System (SIE) may sell only in the states where they are located and those registered in the Federal Inspection System (SIF) may sell to the entire country and, if they meet additional criteria, may export. Interviews with representatives of the companies owning the meat-packing plants revealed that the 157 plants mapped in the Brazilian Amazon belonged to 110 companies, but only 128 plants, belonging to 99 companies, were active in 2016. The meat-packing plants registered with SIF (who may sell throughout Brazil and export) have, on average, a greater slaughter capacity (708 animals/day), demand more suppliers and travel, on average, 360 km to purchase cattle, according to interviews and our estimates. A meat-packing plant registered with SIF would need, on average, about 580 thousand hectares of pasture to supply its annual demand, considering the total use of their average slaughter capacity and the average productivity of pastures. As for the meat-packing plants registered with SIE (who only sell in the state where they are located) they can slaughter, on average, 181 animals/day, can buy cattle up to a maximum distance of 153 km and would need 25% of the pasture area of a packing plant registered in SIF to supply their annual demand. 99 companies can buy from zones that reach 390 thousand ranches holding 93% of the Amazon herd. We estimate that the potential buying zones for all of the 128-active meat-packing plants extend to regions that encompass 91% of existing pastures in the Amazon – which is compatible with the fact that they account for 93% of the cattle slaughtered in the region. Thus, we estimate that the 99 companies, owners of the 128 active plants, can directly or indirectly influence 390 thousand ranches with a total estimated herd of 79 million head (93% of the total). We further estimate that the potential buying zones for the meat-packing plants affect regions that contain the majority of problems associated with deforestation in the Brazilian Amazon: 88% of the total of embargoed areas by Ibama, 88% of the area deforested from 2010-2015 that was not embargoed (although a large share may be illegal) and about 90% of the areas at greater risk for deforestation from 2016-2018 (of a total of 1.68 million hectares of forests). Therefore, demanding that the 110 meat-packing companies – which are the doors to the market – follow the law or commit to zero deforestation seems to be a more promising path to reducing deforestation than individually inspecting tabs on the 390 thousand ranchers. Our analyses revealed various advances with the agreements and many challenges. 70% of the slaughter capacity is in meat-packing plants that have signed TACs. Crossing our list of meat-packing plants with records of the Public Prosecutors in the Amazon, we discovered that 49% of the active meat-packing plants (63 of the 128) registered with SIF and SIE signed TAC and that they hold 70% of the slaughtering capacity of all the packing plants. Thirty-eight companies control those meat-packing plants. The purchasing zones of those companies jointly cover 86% of the total of embargoed areas by Ibama, 83% of the area deforested from 2010-2015 that was not embargoed (although a large part may be illegal) and about 85% of the areas under greatest risk of deforestation from 2016-2018 (of a total of 1.68 million hectares of forests). Thus, if they all complied with the agreements, the potential for reducing deforestation would be significant. There is evidence that some companies are boycotting purchases from irregular ranches including a scientific study of a meat-packing company (JBS) and independent audits of the public commitment of the three largest meat-packing companies operating in the region (JBS, Marfrig and Minerva). However, it has not been verified if all of the signatories are controlling the suppliers, whether because of delays in the independent audits that should have been made by all the signatories or due to the lack of dissemination of results of audits done in Mato Grosso. Even the companies that signed TACs are exposed to the risks associated with deforestation. The first problem is that ranchers have evaded boycotts using laundering mechanisms. For example, ranchers rent embargoed ranches to other ranchers, who sell the cattle using documents (CPF, CNPJ, CAR) that are different from those on the Ibama or state embargo lists. The frauds are facilitated because the public managers complicate or prohibit access to public information on CAR and information on transport of cattle between ranches and from ranches to the meat-packing plants (the Animal Transport Permit-GTA). The GTAs are obligatory and are issued by state animal health control agencies. Pará is the only state in the region that allows full public access to CAR data for ranches. The second major challenge is that most meat-packing plants do not control the indirect supply ranches, meaning those where the cattle were born and spent some time before arriving at the fattening ranches, who sell the fattened cattle to the meat-packing plants. One meat-packing company evaluated that about half of the direct supply ranches buy cattle from other ranches before fattening and selling them to the meat-packing plants. There are ways to control the indirect suppliers, as pilot projects in the region and experiences in other countries have shown, but neither the market nor the MPF can effectively control the indirect suppliers so far. After the first TAC pilot audit in Pará, in 2014 the state government began an innovative approach to facilitate control over all ranches, including the indirect ones: only issuing animal transport permits (GTA) to ranches registered with CAR. However, due to resistance from the state animal health agency in Pará, Adepará, and difficulties in coordination between Adepará and State Secretariat for The Environment and Sustainability of Pará (Semas), the initial calendar was not met. After new demands by MPF, a new calendar was put in place and the link between issuing the GTA to CAR was supposed to be demanded for all ranches in Pará by October 2018, but informants have declared that this linkage had again been paralyzed. The third challenge is that 30% of the slaughter capacity is in meat-packing plants that have not signed the TAC. This involves 65 active meat-packing plants, belonging to 63 companies. In general, those meat-packing plants buy in the same zones as the meat-packing plants with TAC. Thus, a portion of the ranchers boycotted by the companies with TAC is able to sell to meat-packing plants without TAC – which means a leakage of the effect of the agreements and unfair competition with companies that are trying to assume costs to exclude ranchers who deforest. For example, ranchers in Pará can sell to both meat-packing plants in their own state and to meat-packing plants in neighboring states, such as Tocantins, Amapá, Amazonas and Maranhão. Meat-packing plants from Amazonas without TAC also buy from Rondônia and, can thus “export” the deforestation risk to that state. Those barriers to the advances of agreements and the fact that the government has been reducing environmental protection, facilitate an increase in deforestation. For example, since 2012 the deforestation rate has increased 75% after Congress and the president at the time forgave part of the deforestation when changing the Forest Code and reduced the size and degree of protection of Conservation Units and the number of inspectors at Ibama and the Chico Mendes Institute for Biodiversity Conservation (ICMBio) da Amazônia. The great majority of companies continue being exposed to the risks associated with deforestation: the TAC signatories because they suffer the effects of frauds and do not control the indirect suppliers and non-signatories because they do not adopt any form of control over the suppliers. The companies most exposed to the risks have various plants distributed in the region, supply the domestic market and may export (SIF) or serve a large state market in regions with little local supply of cattle, and thus buy from distant areas using cheap river transport. The companies with TAC that are at the top of the risk ranking would probably be the ones most benefitting from efforts at improving control. They already adopt some type of control and would have lower costs moving forward and might be more rapidly benefitted by the market. Additionally, they would benefit from enforcement against unfair competition from those who do not adopt any control. In this group is JBS, potentially the company most exposed to the risks associated with deforestation, since it has 32 plants in the region, of which 21 are active. In the potential buying zones of those plants are 4.6 million hectares with some type of risk, including 1.7 million hectares embargoed, 1.6 million hectares of area deforested from2010-2015 and 1.2 million hectares of forest at risk for deforestation from 2016 to 2018. Another four companies occupied a second level of exposure to risk. The Redentor meat-packer in northern Mato Grosso occupied the second position in the ranking with only one plant, but located in a region with high rates of embargoed areas, recent deforestation embargos and with high risk of future deforestation. The three other companies have more than one plant: Marfrig (5 plants), Vale Grande (3 plants) and Meat-packing plant Mercúrio (2 plants). It is notable that the various companies without a TAC also occupy a significant position in the ranking of potential exposure to deforestation risk. Getting those companies to boycott cattle associated with deforestation could result in rapid gains in controlling deforestation. At the top of this ranking is the Figo Manaus meat-packing company, which stands out because it buys cattle in a zone that during the rainy season can extend to animals more than 1,000 km away, in Pará and Rondônia, when they supply of animals near Manaus becomes scarce. A second group with greater exposure includes ten companies, nine of them registered in SIF – meaning they can sell beef and beef byproducts on the national market and, if properly enable, in international markets as well –, who buy from long distances (e.g. Bovinorte, in Manaus-AM) or who have more than one plant (e.g. Total, in Rolim de Moura and Ariquemes and Distriboi, in Cacoal and Ji-Paraná, all in Rondônia), or that are located in areas under great pressure for new deforestation (e.g. T. M. da Silva de Carvalho, in Novo Progresso-PA). Will ranching continue to be associated with deforestation in the Amazon? After assessing the advances and challenges so far, we now reflect upon the future: will the agreements made by the companies be consolidated and expanded and lead to a drastic reduction in deforestation? Or will part of the market continue buying from ranchers who deforest? To answer these questions, we analyze the forces in favor and against deforestation and their relation with the ranching agreements. The history of the sector shows that significant changes in behavior by ranchers and meat-packing companies have occurred only when they have been boycotted or about to be boycotted or were at increased risk of legal sanctions or losses to reputation (which might lead to future losses of market or financing). Considering lessons from the past and future possibilities, we conclude that the forces favoring deforestation are at a short-term advantage, but that there are possibilities for turning the game around. There are several promises of national and international commitments to eliminate or drastically reduce deforestation from 2020 to 2030. However, the advances are still modest and achievement of goals is uncertain. In 2016, exports increased with the opening of the Chinese market, which may increase pressure to deforest. At the same time, the government continues to deny access to data on the identification of holders of rural properties registered with CAR and on cattle transport (GTAs), which could facilitate control over cattle sold directly and indirectly. Furthermore, the president of Brazil and Congress are approving laws that reduce de level of protection of Conservation Units and that extend the deadlines for illegal occupants to request the regularization of titles to public lands. In April 2017, an operation by Ibama in Pará (Carne Fria, meaning “Cold Beef”) embargoed packing plants and one exporter of live cattle accused of buying cattle from embargoed areas. However, those immediate results were weakened by actions from the federal government, regional politicians and the Judiciary. Nonetheless, Ibama has demanded that the companies administratively unembargoed present solutions within 90 days to avoid purchases from irregular areas. After that, some of the large supermarkets have demanded information from meat-packing plants accused by Ibama and indicated that they may halt purchases if the answers are not satisfactory. That demand is helping to accelerate development of a pilot project for control of indirect suppliers that was being discussed by ranchers in Pará. The meetings that the Pará government called to assess the options for improving implementation of the TAC after operation Carne Fria may be a space for expanding the pilot initiative. The first meetings included Ibama, Ministry of the Environment (MMA), MPF, producers and meat-packing companies. The project could be accelerated with the participation of major buyers of products from meat-packing plants and the other necessary sectors of the government such as the Ministry of Agriculture, Ranching and Supply (Mapa). The Brazilian Supermarket Association (Abras), which signed a commitment with MPF, should also engage in strengthening the role of retailers. As our data show, fewer than 50 companies are responsible for the great majority of cattle slaughtered. Operation Carne Fria may still lead to other indirect impacts. Ibama has suggested to MPF in Pará the execution of sanctions established in the TAC against meat-packing companies that violate the agreement. The MPF may apply the sanctions extrajudicially (without intervention by a judge), which could accelerate the adoption of best practices. Thus, the effect of the operation in the short term will largely depend on the decision of the MPF, which stated it was awaiting responses from the meat-packers before deciding what to do about the Ibama recommendations. In the short term, the TAC audits and TAC sanctions resulting from operation Carne Fria may be the most promising events against deforestation. Twenty-two companies who signed the TAC in Pará and 12 in Mato Grosso have contracted independent audits. If the MPF and the market punish the meat-packing plants who violate the agreements, the companies will tend to strengthen control, including over indirect suppliers. However, the reactions against operation Carne Fria show that it is necessary to halt political pressures against environmental agencies. The environmental sector could learn from the recent experience of fighting corruption in Brazil. The use of communication strategies has helped the Lava Jato investigators to obtain support from the population and halt political pressures. A communications plan could have two lines of action. One would highlight the negative social, environmental and economic impacts of deforestation. The other would demonstrate that fighting deforestation has not prevented and will not impede economic development in the country, since it is possible to increase production in the vast deforested areas that are poorly utilized, both in the Amazon and in the rest of the country. The tide may also turn in the battle against deforestation because of the environmental campaigns that can occur at any moment and weaken the forces favorable to the deforestation. Greenpeace suspended its negotiations with JBS on the Public Commitment by Ranching shortly after operation Carne Fria and later suspended participation in the agreement with all the companies due to the lack of advances, the revelation of the involvement of the controlling partners of JBS in corruption and setbacks in environmental policies. 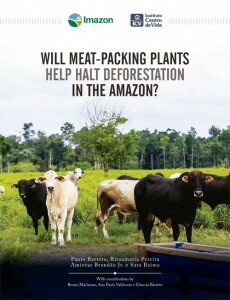 Because of the increase of deforestation in the Amazon, it is plausible to believe that new campaigns will occur focusing on the meat-packing plants that operate in the region. Several promises made by the private sector, governments and multilateral agencies against deforestation have 2020 to 2030 as deadline. These measures have so far had little immediate effect on the ground. If the promises are kept, they may have an effect, especially with regard to the larger companies. International agreements and initiatives. In 2010, the Consumer Goods Forum (CGF), made up of major international corporations such as Unilever, Walmart and MacDonald’s, promised to achieve zero net deforestation in their supply chains by 2020. Zero net deforestation implies that the loss of forest must be offset through reforestation or natural regeneration. In 2014, governments, companies and civil society approved the New York Declaration on Forests (NYDF), which is an international voluntary and non-binding declaration for taking measures to reduce global deforestation. Goal two of the NYDF is to support and aid the private sector in eliminating deforestation linked to production of agricultural commodities such as palm oil, soy, paper and meat by no later than 2020. Among the companies are Cargill, Unilever, Procter & Gamble, McDonald´s, Johnson & Johnson and Nestlé. The Brazilian government is not a signatory, but the states of Acre, Amapá and Amazonas are. In 2015 the Brazilian government and other countries adhered to the Sustainable Development Goals of the United Nations (UN), which include halting deforestation by 2020. Brazil, as a signatory, agreed to annually present a Voluntary National Review on advances towards reaching the goals. Although voluntary, this agreement is more ambitious than the policy on climate changes whose goal is to reduce Amazon deforestation to less than 3,800 square kilometers by 2020 and to eliminate illegal deforestation by 2030 (referring to the Paris agreement, to which Brazil is also a signatory). The annual review will expose the countries that are not advancing toward their goals, but the consequences are uncertain. National policies. The Brazilian and state governments have instituted other goals. The National Monetary Council and the Central Bank, through Resolution no. 4.327/2014, require that financial institutions and other institutions authorized to function by the Central Bank of Brazil establish and implement the Socioenvironmental Responsibility Policy (PRSA) beginning in February 2015. The government of Mato Grosso promised to reduce deforestation 90% by 2030 and eliminate illegal deforestation by 2020. In 2016, the federal and state governments increased enforcement in the state, but 95.4% of the area deforested in Mato Grosso did not have authorization from the environmental agency. In 2016 deforestation fell by only 6% in Mato Grosso compared to 2015. The dissuasive power of enforcement was probably weakened by the recent amnesties. In Pará, in 2012, the state governor established a goal of eliminating net deforestation by 2020. Despite programs in the state such as the Green Municipalities Program and the Pará 2030 strategy, deforestation in the state continues high and rose 75% from 2012 to 2016. The case of Pará seems to show that local plans are insufficient for dealing with market forces and national plans that favor deforestation, such as the reduction of legal protection and major infrastructure projects that attract immigrants without the execution of mitigation measures. This situation is serious because it seems unlikely that the current leaders of the federal Executive and Legislative will spontaneously strengthen measures against deforestation. The advances of those policies will depend upon an increase in pressure over those public agents, from Brazilian civil society, agents of the market and the international community. However, the international medium and long-term promises are presenting insufficient advances. A global analysis of 500 companies, investors and governments has revealed that commitments such as those by the CGF and NYDF will not be met by 2020 or 2030 if the rate of progress observed up to 2016 is maintained. Most of the countries that import products linked to deforestation do not have measures that restrict purchases. The forces against deforestation may change it those assessments of the commitments inspire short-term concrete actions. For example, eight companies are working with the Carbon Disclosure Project (CDP) to collect information from their main suppliers on how they are managing the risks associated with deforestation. The analysis of data from suppliers collected in the pilot year of 2017 will be published in the annual report of the supply chain for the CDP in January 2018. Among the eight companies are JBS and Arcos Dorados, the McDonald’s franchise in Latin America. In short, the success of promises and agreements depends upon more impacting steps or for implementation in the short term – such as sanctions or market restrictions if certain goals are not met. Prior experiences have shown that ranchers and agroindustry respond pragmatically when pressures and incentives are clear and consistent. Without clear pressure from outside the sector (from the market, Society and public agencies), it is likely that many meat-packers will not assume commitments and that the agreements will not be effectively implemented. In that scenario, thousands of ranchers in the Amazon will continue felling and burning forests to raise cattle.